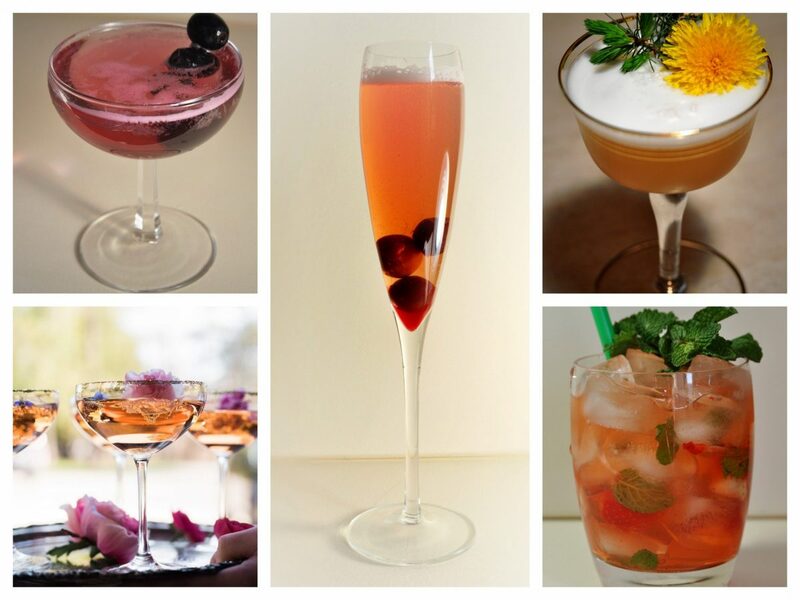 A wedding signature cocktail is a delicious, personal touch to your cocktail hour and is an instant conversation starter. 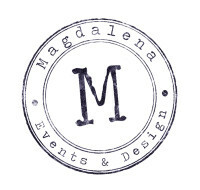 The challenge may be narrowing down your choices to a favorite or something you think your guests will like. You may want to serve something special, perhaps something your friends and relatives have never tried and what better way to give a glimpse of who you are than by offering favorite Hers and His drink. Strawberries and rhubarb are one of my favorite flavor combination. As a child I used to cut the rhubarb from our garden, peel it, dip it in a sugar and slowly bit it to savor that one of a kind tart flavor. The essential character or rhubarb only gets better when blended with strawberries. Cocktails with these ingredients are delicious and refreshing. Muddle strawberries and mint, add rhubarb syrup and gin, shake it in martini shaker. 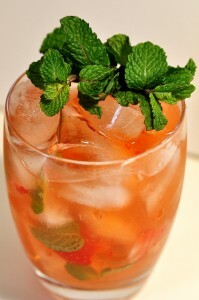 Pour the mixture into glass, top it off with club soda and garnish with strawberry or mint. Rhubarb syrup: (chop rhubarb into 1/2 inch pieces, boil with 1/2 part sugar +1/2 part water until rhubarb falls apart and looses color; strain rhubarb and make sure the liquid has a syrupy consistency, if it’s too watery, cook it for a few more minutes until water evaporates some more). Dry shake all the indgridients first and than add ice, shake it again and strain into a chilled glass. 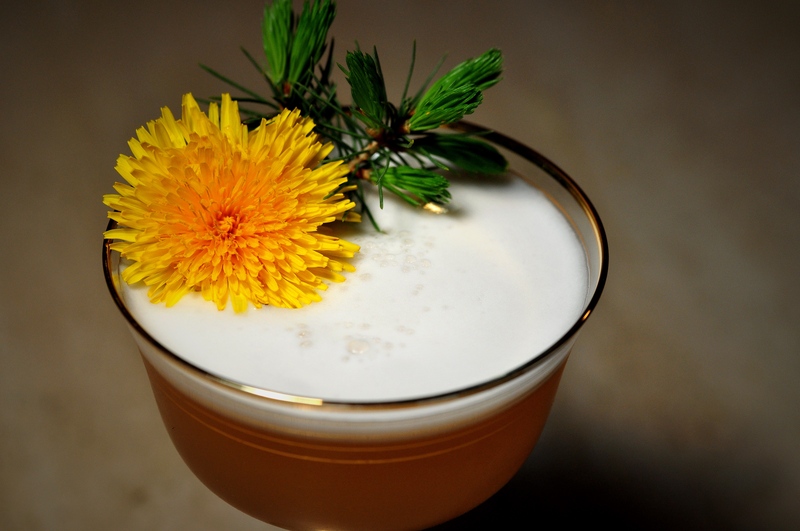 Garnish with dandelion flower. Dandelion-Pine Syrup: Pick the pine needles off the branch in an early spring. Chop the branch into 1-inch pieces (1 cup). In a medium saucepan, combine the needles, chopped branches and water(3 cups); bring to a simmer. Cook for 40 minutes. Stir in the sugar (1 cup) until completely dissolved. If it’s thick enough for your liking, lower the heat and add early spring dandelion petals. Boil for couple of minutes. Remove from the heat and let it cool. Steep over night and drain the liquid. Refrigerate. How about creating your own infused liquor just for your wedding? I remember my grandfather always made homemade cherry brandies grown on the family farm and I have a really soft spot for it. My grandpa served his brandy on special family occasions. As a little girl, maybe 4 or 5 year old, I loved to hide under the table and wait for some kind of distraction so when nobody was looking I sipped the rest of the liquid from the glasses and eat the cherries. Something about the combination of smell and strong alcohol that came up strongly up my nose at first, but with more time chewing the cherry got fruitier and sweeter. Heaven! 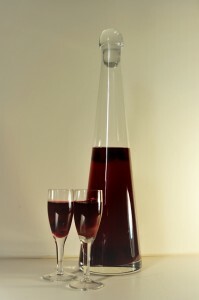 To make cherry liquor we will need vodka (1Liter, 95%), local ripe cherries (6.5 lbs), sugar (5 cups) and water (1 Liter or aprox 34oz). Place washed cherries in a large jar, add water and vodka. Cover the jar with a lid. Store it in a warm, dark place for 4-6 week; stirring occasionally. Strain infusion and put the cherries in a separate jar, add sugar and mix cherries to coat. Let the fruit sit for another 2-3 weeks (out of the sun) until sugar dissolves. Make sure to give the jar a shake from time to time. Strain the syrup from the cherries. Mix the syrup with the vodka. Keep some cherries for the garnish. 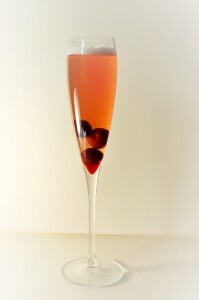 Put cherries and your cherry liqueur into a champagne flute, slowly pour champagne and add few drops of rose water to add dreamy aroma. If you like martinis, this is a recipe you can reference year round but it really shines in the summer. Combine alcohol, bitters & syrup in a shaker with ice and shake until well chilled; strain into martini glass and garnish with lavender sprig. Put all ingredients into shaker. Shake, shake, shake! 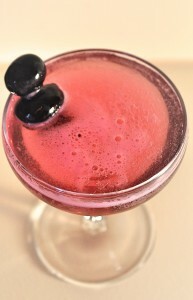 Strain into a coupe glass, garnish with a grape. In a rocks glass: muddle ginger and rosemary. Add ice, bourbon, and cider. Stir and garnish with rosemary sprig. 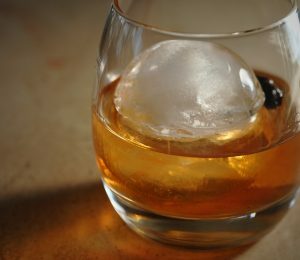 In a rocks glass, combine the maple syrup with the bitters. Add the fig and lightly muddle. Add the bourbon and stir well. Fill the glass with ice and top it with chilled seltzer.